The P-38 was extremely advanced for the late thirties and the development program was secret until very close to the U.S. entry into the war. Nonetheless, by early 1941, word of the radical-looking new fighter had reached GM styling chief Harley Earl. GM was heavily involved with the project — the Allison Division built the engines, using many parts made by Cadillac, and Oldsmobile Division built the cannon — so that spring, Earl called in a few favors and wrangled permission to take several of his senior designers, including Bill Mitchell, Art Ross, and Frank Hershey, to see the early-production P-38 at Selfridge Field. Earl’s men were deeply impressed with the sleek, twin-tailed aircraft. Conventional single-engine, single-tail fighters were not of great interest to most automotive designers since such aircraft had few elements that could be applied to cars, but the P-38 was a different story. According to Bill Mitchell, the designers were particularly struck by the way the lines of the tail booms carried through from nose to tail, but the Lightning offered a host of intriguing details, from the air intakes on the flanks of each boom to the stubby, rounded vertical fins. 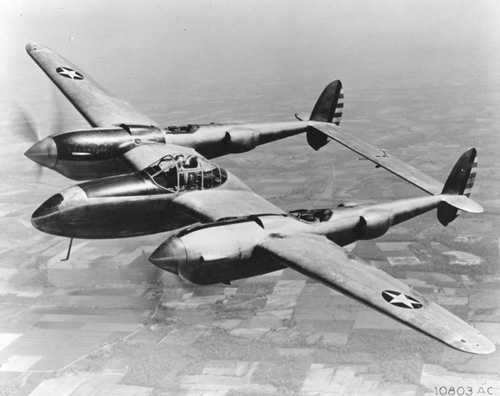 Each of Earl’s designers began toying with concepts inspired by their viewing of the P-38, but their work was shortly interrupted by America’s entry into the war. While the P-38 went on to an impressive service record in Africa and the Pacific, Frank Hershey and Bill Mitchell joined the Navy, while Art Ross went to work designing military hardware. In the fall of 1944, Frank Hershey received a medical discharge and returned to General Motors. Bill Mitchell, who had been in charge of the Cadillac studio before the war, was still in the service, so Harley Earl made Hershey the interim chief of Cadillac design. In that capacity, Hershey developed a series of concepts inspired by the P-38, some (but not all) of which incorporated tailfins. These designs evolved into the aerodynamic C.O., or “Interceptor,” which was eventually built as a full-size, running prototype. It was too radical for Harley Earl’s tastes and it went nowhere. In May 1945, Earl transferred Hershey to GM’s Special Car Design and Export studio. Hershey remained fascinated with tailfins, however, which also appeared on studies he did for GM’s British subsidiary, Vauxhall. Those early fins were very modest, stubby extensions of the rear fender tips — a far cry from the grandiose shapes they were later to become. Frank Hershey’s involvement with Cadillac’s postwar production cars might have been very limited had it not been for a prolonged UAW strike that began just before Thanksgiving 1945. The strike led to a lockout that lasted until the following March, bringing most development work to a grinding halt. However, Hershey and his family had recently purchased a 60-acre farm, Winkler Mill, about 15 miles (25 km) outside of Detroit, and during the lockout, he invited the Cadillac design team to work at his farm while they prepared the 1948 Cadillac line. Working at Hershey’s farm gave the design team, then headed by Bill Mitchell, considerably more latitude than they might otherwise have had in their normal studios. Harley Earl dropped in periodically to see how the designs were coming along, but the stylists were otherwise left to their own devices. Naturally, Hershey himself played an active role, convincing stylist Ned Nickles to adapt his P-38-inspired fins into the rear fender line — a bold decision, given that Harley Earl had not been terribly thrilled with the fins on Hershey’s earlier concepts. The left taillight is hinged, flipping up to reveal the fuel filler. 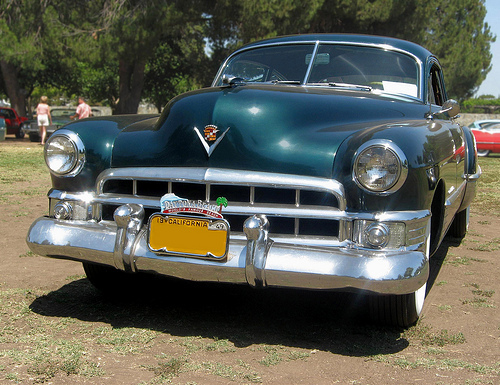 Cadillac first adopted this feature in 1941. Not only was it a conversation piece, it obviated the need to clutter up the fenders with a conventional fuel filler cap. Indeed, the fins came perilously close to costing Hershey his job. 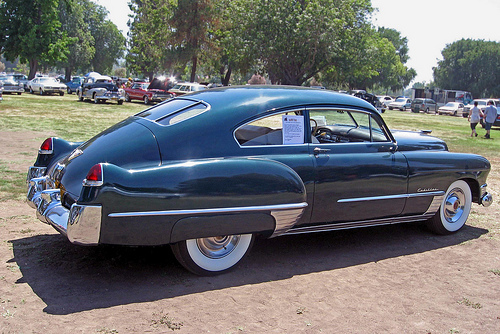 When Earl and Cadillac general manager Nicholas Dreystadt saw the fins on a full-size clay model of the ’48 Cadillac, Earl ordered Hershey to remove them. Hershey, then focused on the front end, did not immediately comply. When Earl returned two days later and saw that the fins were still present, Earl threatened to fire Hershey if he didn’t remove them immediately. Fortunately for Hershey, GM’s most senior executives, company president Charlie Wilson and chairman Alfred P. Sloan, decided they liked the tailfins, which Sloan felt would be an effective stylistic trademark for Cadillac. Two days later, Earl asked Hershey if he had removed the fins yet. When Hershey cautiously said no, Earl breathed a sigh of relief and told him to leave them on. From then on, Earl became an enthusiastic supporter. 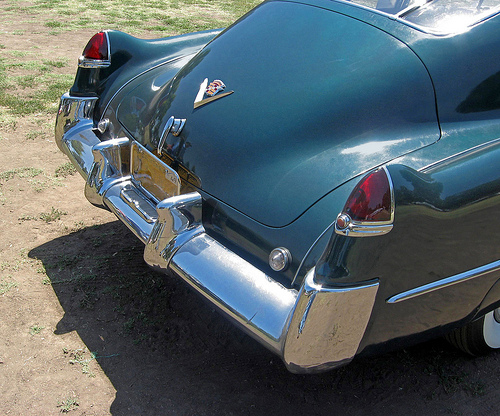 Compared to their late-fifties grandeur, the 1948-49 fins were decidedly modest in height and scope. Their resemblance to the P-38’s vertical fins is clear; Cadillac literature described them as “rudder-type” fins. Despite Sloan and Earl’s enthusiasm, Cadillac management was afraid that the fins would alienate Cadillac’s conservative clientele. Ed Cole, recently appointed as the division’s chief engineer, liked the fins, but new general manager Jack Gordon, who replaced Nicholas Dreystadt in June 1946, was wary. Mitchell later recalled Gordon walking into the studio and staring at the fins of the full-size clay model for many long moments before declaring that the fins were just too high. Gordon told Mitchell to shorten the fin by 0.75 inches (19 mm), to which Mitchell reluctantly agreed. However, as soon as Gordon left, Mitchell resorted to a bit of sleight of hand. Instead of shortening the fins, he made one fin taller so that it would look like the other, unchanged fin had been shortened. Gordon returned the following day and promptly declared that he’d been right about the fins looking better shorter. He eventually discovered that he had been tricked, but the fins went into production without further tampering. 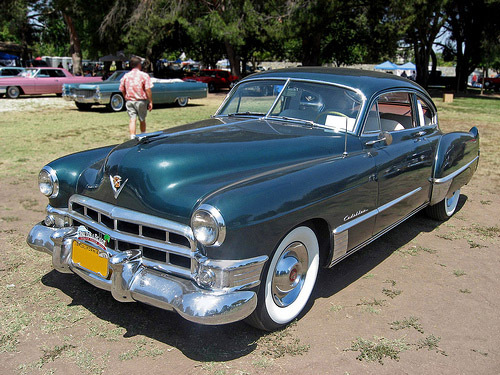 A 1949 Cadillac Series 62 club coupe was 214 inches (5,436 mm) long on a 126-inch (3,200mm) wheelbase, almost identical to the ’48, but it was 290 lb (131 kg) lighter. Base price was $2,966, but 97% of production had the optional four-speed Hydra-Matic, which added $174. The club coupe was less popular than the four-door sedan, accounting for only 7,515 sales (not counting Coupe de Villes). Despite Gordon and Dreystadt’s fears, Cadillac’s customers were not dissuaded by the fins. Admittedly, demand for all new cars was still fierce in 1948 — many dealers made buyers sign agreements not to resell their cars for at least six months, to discourage the thriving gray market. Cadillac sales for the 1948 model year were only 50,638 (not including long-wheelbase commercial chassis), but those modest numbers reflected the production delays caused by the UAW strike; the ’48 cars didn’t go on sale until March 1948, about four months later than normal. The basic styling of the 1948 cars carried over into 1949 with only a modest facelift, including a simplified, bolder-looking grille and a new dashboard design. There were greater changes under the skin: Thanks to Cadillac’s new overhead-valve (OHV) V8 engine, the ’49s were nearly 300 pounds (131 kg) lighter than the ’48s, giving them brisk performance and surprisingly good fuel economy. The ’48s hadn’t been slow, but the ’49s had the power to match their racy looks. The bold grille design marks this as a 1949 model. Behind it is Cadillac’s new 331 cu. in. (5,425 cc) OHV V8, making 160 gross horsepower (133 hp net; 99 kW). Like the contemporary Oldsmobile Rocket V8, it was lighter, more powerful, and more fuel efficient than the flathead engine it replaced and was also smaller and lighter. Cadillac used this basic engine design, with many revisions, through 1967, eventually expanding it to 429 cu. in. (7,025 cc). It found its way into a fair number of race cars in the late forties and early fifties. Cadillac scored an additional stylistic coup late in the model year, with the introduction of a new hardtop body style: the Coupe de Ville. The hardtop body, shared with the new Buick Roadmaster Riviera and Oldsmobile Ninety-Eight Holiday, was developed by Ned Nickles, who had become head of Buick styling in 1947. The hardtop omitted the B-pillars of the regular two-door club coupe, making it look like a convertible with the top up. Thanks to its late introduction, the Coupe de Ville accounted for only 2,151 sales in 1949, but the hardtop body style would become enormously popular in the 1950s. With great style, strong performance, enviable build quality, and ample prestige, Cadillac sales soared to 92,554 for 1949, by far its best year to that time. That wasn’t quite enough to edge out Packard, but in 1950, Cadillac outsold its old foe by more than two to one, claiming the crown as America’s leading luxury car. Even with the older monoblock flathead, forties Cadillacs hadn’t been slow, but the new V8 made them among the fastest cars in America. The lightest Series 61 club coupe was capable of 0-60 mph (0-97 km/h) in under 14 seconds and a top speed of around 100 mph. Even a heavier Series 62 sedan with Hydra-Matic could run 0-60 mph (0-97 km/h) in under 16 seconds, which was brisk performance for the time. By then, Hershey’s GM career was over. Hershey later claimed that Earl fired him after learning that Hershey had been doing freelance work for non-automotive outside clients. Although Earl himself owned an independent design studio, the Harley Earl Corporation (HEC), he did not tolerate moonlighting by his staff; however, Hershey claimed that Earl later invited Hershey to run HEC for him, although Hershey declined. Hershey went on the Packard and then joined Ford Motor Company in 1952 as director of styling and chief stylist for the Ford division. His leading accomplishment at Ford was the original, two-seater Thunderbird. Hershey resigned in 1956, not long after being passed over for the vice presidency of styling in favor of George Walker. He went on to Kaiser Aluminum and a variety of non-automotive design work. He died in 1997. The P-38 Lightning was produced throughout World War II. Although it had various weaknesses (particularly in the area of mechanical reliability) and was not universally beloved, the type was quite successful in strategic terms. Many Lightnings had been written off and scrapped by 1950, although a few lingered in operational service in Italy, Honduras, and Cuba into the late fifties. Some surviving P-38s became air racers; after the war, U.S. civilian pilots could purchase the fighters as military surplus for surprisingly little money. Only a handful remain in flyable condition today, including a P-38F called “Glacier Girl,” which spent almost 50 years frozen in an ice floe before being recovered and restored. Cadillac’s tailfins, however, survived long after the P-38 had been forgotten. As Charlie Wilson and Alfred P. Sloan had hoped, they quickly became a Cadillac trademark, and they sparked an international craze. By 1960, nearly every manufacturer in the world had toyed with fins at least briefly. Even conservative Mercedes-Benz adopted them for its 1959 Heckflosse (“Fintail”) sedans. 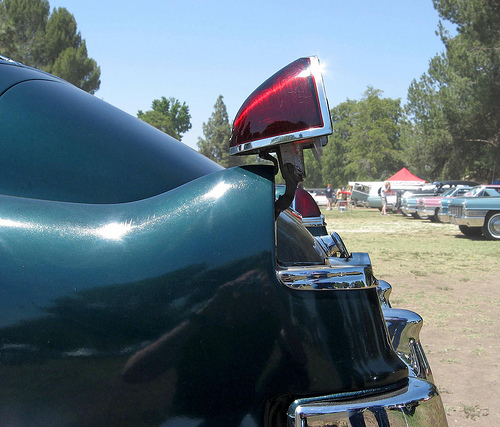 Cadillac’s own fins reached their apogee in 1959, but their vestiges lingered well into the 1980s. By the mid-1960s, Cadillac’s fins had been greatly subdued, a far cry from the space-cadet grandeur of the ’59s, but they weren’t entirely gone. This is a 1965 convertible De Ville. Mitchell later said fins were an essential part of Cadillac’s visual identity. That’s debatable, of course, and Cadillac certainly took the theme well over the top in the late fifties. Still, looking at the lackluster designs that Cadillac has fielded in the past 15 years leaves us wondering if Mitchell had a point. Say what you will about Cadillac’s current “Art and Science” design language — the author is not a fan — but nobody is likely to put it on a postage stamp. By comparison, the 1949 Cadillac, dated though it may be, remains a strikingly attractive car by most any standards. We don’t generally approve of retro styling, but perhaps Cadillac is missing a bet. In 2013, we published a version of this article in Autoweek magazine. However, Autoweek had no connection with the original article. Our sources for this article included C. Edson Armi, The Art of American Car Design: The Profession and Personalities (University Park, PA: Pennsylvania State University Press, 1988); John Barach’s 1948 Cadillac page, Motor Era, www.motorera. com/ cadillac/cad1940/CAD48S.HTM, accessed 7 February 2009; John R. Bond, “Car of the Year: The 1949 Cadillac,” Motor Trend November 1949, reprinted in Cadillac Automobiles 1949-1959, ed. R.M. Clarke (Cobham, England: Brooklands Books Ltd., ca. 1985), pp. 8-9; Arch Brown, “1948 Cadillac 61: The First Shall Be Last,” Special Interest Autos #171 (May-June 1999), reprinted in The Hemmings Book of Cadillacs, ed. Richard A. Lentinello (Bennington, VT: 2000), pp. 52-59; Arch Brown, Richard Langworth, and the Auto Editors of Consumer Guide, Great Cars of the 20th Century (Lincolnwood, IL: Publications International, Ltd., 1998); Cadillac Motor Car Division of General Motors Corporation, “Cadillac…From Peace to War” [brochure], 1943; Jan Chciuk-Celt’s 1948 Cadillac design page, (28 February 2002, home.teleport. com/~flyheart/ hershey.htm, accessed 8 February 2009; David R. Crippen and William L. Mitchell, “The Reminiscences of William L. Mitchell,” August 1984, Automotive Design Oral History Project, Accession 1673, Benson Ford Research Center, www.autolife.umd.umich. edu/Design/ Mitchell/mitchellinterview.htm, accessed 7 February 2009; Helen Jones Earley and James R. Walkinshaw, Setting the Pace: Oldsmobile’s First 100 Years (Lansing, MI: Oldsmobile Division of General Motors Corporation, 1996); Franklin Q. Hershey and J.M. Fenster, “Glory Days! My 35 Years as an Automobile Designer,” Automobile Quarterly Vol. 27 No. 1 (1987), pp. 14-31; Nick Georgano and Nicky Wright, Art of the American Automobile: The Greatest Stylists and Their Work (New York: SMITHMARK Publishers, 1995); Dave Holls and Michael Lamm, A Century of Automotive Style: 100 Years of American Car Design (Stockton, CA: Lamm-Morada Publishing Co. Inc., 1997); Michael Lamm, “Two Very Important Cars! 1948 & 1949 Cadillac Fastbacks,” Special Interest Autos #11 (June-July 1972), pp. 10-17, 56; the Old Car Brochures website (oldcarbrochures.org); and Rob Leichester Wagner, Cadillac: A Century of Excellence (New York: MetroBooks, 2002). Information on the P-38 Lightning came from Joe Baugher’s P-38 page (19 June 1999, http://home.att. net/~jbaugher1/ p38.html, accessed 7 March 2009; David Donald, “Lockheed P-38 Lightning: ‘Fork-tailed Devil’ from International Air Power Review Vol. 14 (2004), pp. 124-155; and Greg Goebel, “The Lockheed P-38 Lightning,” v1.2.1, AirVectors, 1 July 2007, www.airvectors. net/avp38.html, accessed 7 March 2009. Baugher’s page was particularly helpful in sorting out when Earl’s group probably saw the P-38, a point that is obscure in many accounts of that story. The 1949 “basic engine design” is regarded to be the same platform engine up through 1962, not 1967 as this article states. That’s an arguably point. Cadillac did make extensive changes to the engine in 1963, shedding about 50 lb (23 kg), but it was more a revamp of the existing design than a totally new engine. The relationship between the 1963-1967 engine and the ’49 is comparable to the relationship between the nineties 3800 V6 and the original 1962 Fireball V6. The 1968 472 was a clean-sheet design. What do you consider to be Cadillac’s final use of fins? They clearly held out much longer than any other marque, but sources seem to be quite divided, and I’ve never seen a definitive answer. I’ve seen it suggested as sometime in the mid to late ’60s, but that’s clearly erroneous as those bodies did obviously have fins, just much smaller than before. Your article mentions them lasting into the 1980s, which is possible, but it could be even later. 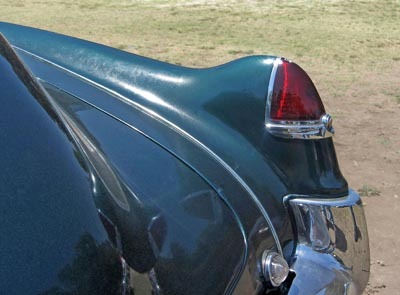 I owned a 1996 Fleetwood (a wonderfully anachronistic car in many respects) that clearly had some vestigial remnant of fins – the rear fender line projected upward past the trunk lid, and outward past the rear facia. The Deville kept a similar arrangement through 1999. 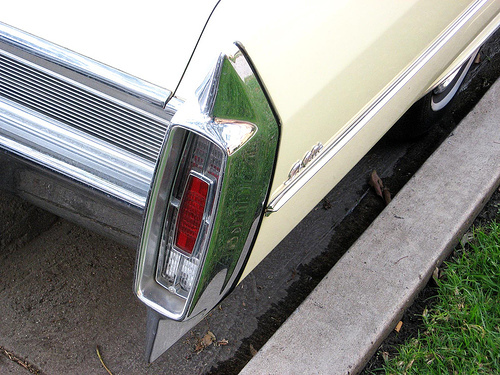 Of course, the thin, vertical tailights used on all current Cadillacs are clearly inspired by the fins, but none of them have any bodywork shapes that would suggest a fin. It seems the fins never definitely died, but just gradually faded away, which does make it difficult to pinpoint when they finally disappeared. It’s a very subjective idea. In 1965, [i]Motor Trend[/i] made a big deal about the end of fins because while there were still peaked taillights, they were now horizontal. A bigger turning point was probably the 1976 Seville (q.v. ), which didn’t have even vestiges to speak of, creating a separate design language for finless Cadillacs (which also included the Allante). The 63′ 390 64′-67′ 429 is a curious amalgam of old and new. It retained aspects of the 49′ OHV engine in the cylinder heads (port layout, bolt pattern, cast iron rocker arms on shafts, intake manifold with separate valley cover). It adopted the large rod and main journals utilized in all the big GM V-8’s (save Chevrolet)of the later 60’s.This engine also featured accessory packaging adopted around the same time by Buick and AMC, namely, packaging the oil pump and distributor in the front cover. Oil pump wear issues associated with running iron gears in a aluminum housing, coupled with a convoluted oil passage routing necessitated by the design, may have lead to this setup being abandoned on the 472-500 engine. It soldiered on in the AMC and Buick engines until their demises, but marred by excessive distributor gear wear in the AMC V-8, and chronic low idle oil pressure in Buick V-8’s, alleviated in the aftermarket with a kit that included longer gears for the pump and a spacer for the body. The 67′ 429, along with modifications for FWD Eldorado use, incorporated a new rocker arm design that in my eyes, was designed with a keen eye towards reduced cost and the knowledge that these engines spent very little time above 3000 r.p.m. It consists of T-shaped rocker fulcrums, one for each pair of valves, with a stamped steel rocker pivoting on each side of the horizontal bar of the t, retained by a stamped steel clip that kept the rockers from walking off the ends of the T. The laymen’s term I would use is hokey. This system was used on the 472-500 family until their demise in ’82. Given your distaste for the new Camaro and Art and Science, I wonder: what modern cars/design languages do you like? While I’ll readily admit neither the new Camaro or Art and Science win any points with anyone with a trained eye for design, I find them pleasing to my own unsophisticated eyes. … especially with the [i]Bullitt[/i]-style wheels, but it’s such an openly derivative retro design that it’s hard for me to respect. I wanted to like the Solstice, but its good proportion are spoiled by lousy detailing and a contrived masculine feel that it doesn’t really pull off. I know people rave about the Cadillac CTS, but it just doesn’t do it for me. Seeing it in the metal, it’s very angle-dependent — depending on where you’re standing, it may look sleek or gawky, and the bulldog-jawed grille doesn’t help. It’s also very wheel-dependent; I saw a base V6 with 16-inch wheels that looked just awful. The British, if you can call them that… Hmm. The Mini is fun, although again, it’s hardly an original design. The Clubman, though, is an atrocity that offends me more than I expected. The Jaguar XK doesn’t look quite as awful as it did initially, but it’s not pretty enough to justify its price. I retain a soft spot for the XJ, but it feels like they ran out of ideas. Why not a pillarless hardtop, a la the XJ6C/XJ12C? Why not…something? Same goes for the Aston Martin. I liked the shape initially, but its endless repetition has sapped my enthusiasm. Whatever the XJ is missing, the XF is not the answer. It’s not a hideously ugly car, but it looks like the result of an unfortunate midnight liaison between an Aston Martin DB9 and a Buick Lucerne. Odd detailing, big-roller tires, and some of the uglier wheelcovers on the market do not help. This weekend, I was at a British car show (the Queen’s English show in Van Nuys), and saw a variety of Jags from a 1950 XK120 to a 1959 Mk 1 to a 1975 XJ12C. Almost all were impressively pretty in a way the current cars are just not. I am not categorically against modern cars by any means, but in the last few years, I feel styling has really a turn for the ugly. On a personal level, I’m sick to death of design language as a concept. I understand the importance of branding to market position, etc., but it makes me tired. In the last couple of years, it’s seemed to result in some really bad aesthetic decisions, opting for in-your-face over aesthetically pleasing. I’m not a fan of modern BMW styling; I was among those cheering the recent departure of Chris Bangle. The only current BMWs that don’t irritate me are the E92 3-Series coupe (although I don’t like the new M3 very much) and the Z4 (the only place I think the flame-surfacing concept works okay). My feelings about the styling of current cars are mixed, at best. Several cars that I rather liked — the Acura TSX, the Mazda3, and the C-class Mercedes — have been wrecked in their latest styling iterations. Among the Germans, as I said, the BMW E92 coupe is a slick piece of work. I liked the pre-facelift Mercedes SL and SLK better, but they haven’t been ruined by the new design language, so they still have class. The Porsche Cayman is fairly pretty, although as with all Porsches, it feels a little anodyne. The only current VW product I care for at all is the Seat Leon Cupra, which is okay. Audi’s current lineup doesn’t offend, but it feels too bulky, model for model, and I don’t like what they did with the TT. Among the Italians, the Alfa 159 and GT still look great, as do the Brera and Spyder; the 8C leaves me cold. The Fiat 500 is too cute for me, but the Grande Punto looks good. I still like the Ferrari F430 (though it’s not as pretty as the 360 Modena), but I don’t care for the California or the 599 at all. Current Maseratis just look bloated to me — fine detailing on uninspired, bulky shapes — while Lamborghini’s hey-look-at-me extroversion does nothing for me. I’m not sure what the hell happened to Lancia, but I recommend euthanasia. Among the other Europeans, I am oddly fond of the Citroën C5 (although the C6 looks like a last-gen Audi A6, and I don’t much like the C2 or C3), and I haven’t made up my mind about the Renault Laguna coupe. I am one of the few who actually likes Volvo’s current styling, particularly the Pininfarina-styled C70 — a pity it isn’t available as a proper coupe, rather than the stupid retractable hardtop. Among the Japanese, I like the Lexus IS (a little fussy, but one of the better-looking modern sedans) and the Honda Civic sedan (though it took a long time for me to warm up to it), although I don’t like the coupe. Nissan’s lineup ranges from the mildly inoffensive (Altima, Maxima) to the ghastly (the Versa, which looks like it should come on a plate with hoisin sauce), and the Infiniti line has a vaguely thuggish aura that I don’t like at all. The Mazda6 is all right, although I preferred the old one. The facelift of the Mazda3 has spoiled it, but, just to be odd, the facelifted MX-5 actually looks a lot better. I can’t warm up to the RX-8, and the more I learn about the car’s mechanical issues, the less I care to. The Koreans are rarely in the running, although the Kia Pro-Ceed three-door (despite the idiotic name) is a surprisingly sharp piece. I like the old-school gravitas of the Hyundai Genesis, but the coupe feels like a hodgepodge of ill-matched pieces. First off, I’ve very much been enjoying your site. Such well researched and well written pieces! I was curious what your thoughts are on the Cadillac XLR. I’m guessing you don’t care for it as you’re not much on the Art and Science look, but as one who does enjoy the XLR (inside and out), would be curious as to your honest assessment of it (subjective though I know it is).